Continuing Celebrity Cruises’ dedication to advancing the role of women in leadership, Captain Kate McCue’s elevation to command of the Celebrity Summit– a 91,000-ton, 965-foot ship follows that of Lisa Lutoff-Perlo, who was named President and CEO of Celebrity Cruises in December 2014. But, talent is talent – regardless of gender. For her part, McCue has managed ship logistics while sailing worldwide itineraries and played a notable role in the revitalization of ships in Singapore. 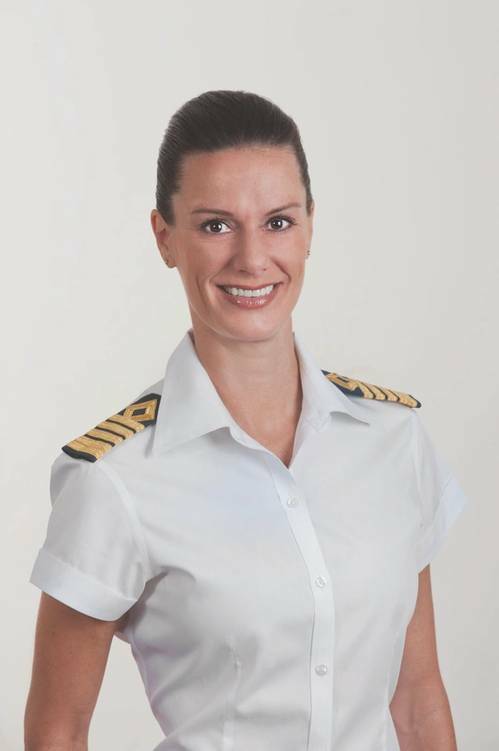 A graduate of the California Maritime Academy, as captain, she will be responsible for the safe navigation of the ship and the on board experience of its 2,158 guests and 952 crew members. McCue began her new role on board Celebrity Summit in August. As that was kicking off, we sat down with her to talk. Listen in as she weighs in on the multiple roles of being a pioneer, a woman on the water and, of course, a Maritime Professional. Your promotion to master is well deserved and representative of how Celebrity not only regards competence, but also how it values the impact that an individual can have on the brand. What do you see as your impact – so far – and then in the future as you step into the center porthole cabin? The brand has provided me with an incredible opportunity, and I intend to take full advantage. It has been extremely gratifying to be recognized by the crew on every ship I visit because they are my second family. Their support and excitement are contagious. Many have told me how incredible this promotion is and how they would jump at a chance to sail as my crew. I also see this as a platform to educate young women about the opportunities the industry has to offer. The president of California Maritime Academy contacted me directly after the promotion announcement, and I intend to assist in any way possible to guide all interested in this career path. What’s the best part of working with and on the commercial waterfront on a daily basis? What brought you there? And what keeps you at it today? Traveling the world is what really intrigued me. The lure of the places cruise ships visit and the time the ships spend in those ports provide ample opportunities to really enjoy the destinations. Which part of your daily routine at Celebrity do you find the most interesting, and why? Routine is one thing this position is not, and there are great advantages to that. Nearly every day you’re in a different place at different times, with conditions never being the same – it’s fascinating, and you’re always on your toes. Also, with arrivals and departures occurring frequently – most times on a daily basis – maneuvering a cruise ship is an experience second to none. Talent is talent – regardless of gender. Tell us what got you promoted up the chain in the first place. Becoming captain is a marathon, not a sprint. Experience is one of the most important traits a captain can possess. My advancement occurred over a period of nearly two decades and through all ranks – from dreamer to deck cadet, third officer, second officer, first officer, chief officer of safety and staff (deputy) captain – prior to my promotion to captain. I have always been surrounded by supportive peers and remarkable captains who took the time and energy to mentor me along the way. As captain, you will be responsible for the safe navigation of the ship and the onboard experience of more than 2,100 guests and almost 1,000 crew members. How different is the role of master on a cruise ship than that of master of perhaps a bulker? Why? The responsibility for the safety of our guests and crew is not new when you get to the position of captain, as one has spent many years on watch, in the conning chair with that responsibility. When transitioning to the cruise sector and prior to becoming a cruise ship captain, even the most experienced cargo ship captain would benefit from putting in the time in other ranks on cruise ships because it is a bit of a different world altogether. I highly recommend experiencing different sectors of the maritime industry, you can appreciate firsthand the diversity and responsibility each has to offer. They have a saying in air freight: The advantage of flying for a freighter as opposed to a passenger jet is that freight doesn’t complain. That’s true enough. But how does the Master impact and make happier paying customers? It is paramount to be a visible captain and to lead by example. It also is the captain’s and the crew's responsibility to be present and accessible, making for happy guests and crew. On your way to your current role, what was your biggest challenge? How about your biggest success? The biggest opportunity is to establish myself in the brand and position. The position naturally warrants authority, and that comes with the respect earned through proven performance. The biggest success is the actual promotion to captain itself. What advice would you give aspiring women who want to get into the maritime industry? The maritime industry is an amazing opportunity to see the world and make a positive impact on it. The maritime academies in the U.S. can be perfect places to start out because maritime still is a relatively growing industry with many opportunities; and my motto about the unknown is: You never know if you want it until you try it. So, when you see an opportunity, seize it. When you spot a problem, fix it. When you want something, ask for it. The role of women in the maritime industry is growing, but is not yet representative of the numbers of women professionals in business. What can be done about that? Times are changing and I believe there will be a much more visible presence of women in the maritime industry. The increasing demand for qualified officers, men and women, is there. Also lending to the growth of the industry are technological advancements – they are eliminating some of the stereotypes previously associated with the seafaring trade. For example, 10 years ago, it was challenging to keep in constant contact with family and friends. Just the advancements in social media over the last decade have brought communication to the tips of our fingers. This only will continue to progress and make the transition from land to sea easier for everyone. Your organization actively recruits women for maritime and management roles. Beyond yourself and the current CEO, briefly tell us about one or two other success stories at Celebrity. Our parent corporation, Royal Caribbean Cruises Ltd., was the first in the industry to promote a woman to captain for our sister brand, with Swedish mariner Captain Karin Stahre-Janson in May 2007. She was followed by Captain Lis Lauritzen in 2008. Both women are extremely well respected by their peers, guests and crew. You are the industry's first-ever American female captain. That said, tell us about your most valuable mentors who helped you get there. Can you choose one to talk about? What did they mean for you, and why? I was fortunate to have found my life partner, who provided me unconditional support – personally and professionally. My husband, Nikola, is a chief engineer. He is a very patient man and loves to share his knowledge of all the technical aspects. We were able to sail together, and – for example – after I would perform arrival or departure maneuvers, he would provide unbiased feedback about my driving ability based on the use of power and overall finesse. Several peers have since accredited my maneuvering to a soft woman's touch, but I like to think that it was a bit of an inside advantage being married to a very skilled and honest chief engineer. During your climb to the top, you have managed ship logistics sailing globally and led several repositioning cruises. What other jobs did you enjoy along the way and which one was the most valuable in terms of preparing you for your current role? I thoroughly enjoyed drydocks and newbuilds in the shipyards. You gain an appreciation for the standard maintenance, design, naval architecture and hard work. Finally – you began your new role on board Celebrity Summit in August 2015. What one thing do you hope to bring on board with you that will put a unique stamp on your own brand of leadership? Everyone I have worked with has a slightly different leadership style based on their backgrounds. I hope to offer a unique experience for my team, and I look forward to pleasantly surprising some.